It’s no coincidence that the stock market’s steep rise in February began just days after an equally steep rise in the dollar stalled in late January. The dollar has been moving sideways ever since, extending a monotonous sine-wave correction that is setting up the dollar’s next powerful rally. It projects to at least 96.30, a relatively modest move of about 2% that would leave DXY a tad shy of a small but technically important peak at 99.25 recorded in August of 2003 (see inset). The dollar has already blown past a more significant ‘external’ peak at 99.25 from 2005, so it’s got nothing to prove. But if the next up-thrust eventually exceeds the 96.30 target as I expect, it would add a robust new dimension to the bull market begun in earnest last year. 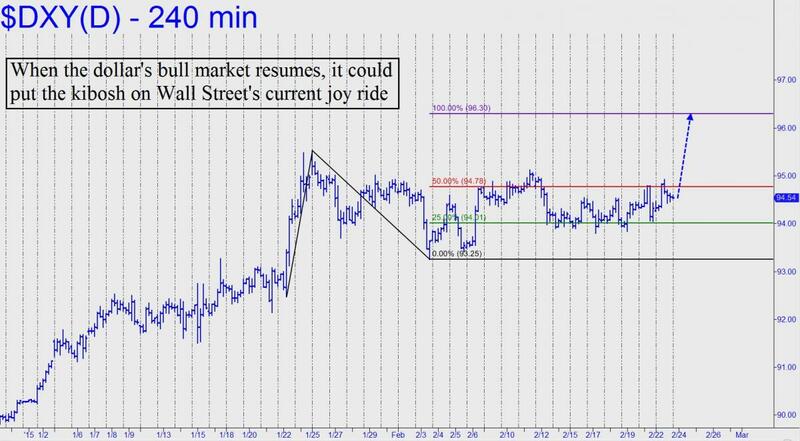 It would also put considerable pressure on U.S. stocks, perhaps even ending February’s joy-ride on Wall Street. Take a free trial subscription that will allow you to access not only the touts, bulletins, updates and impromptu trading webinars during market hours, but a 24/7 chat room that draws veteran traders from around the world.